10x Return on Investment! – CleanTech Water Filtration Has Arrived! One of the many benefits of FilterBalls is reduced resistance compared to sand resulting in less pressure, increased flow, and greatly reduced power requirements in your filter system. An independent pool retailer benchmarked FilterBalls in two above ground demonstration pools to see how the FilterBalls would perform. 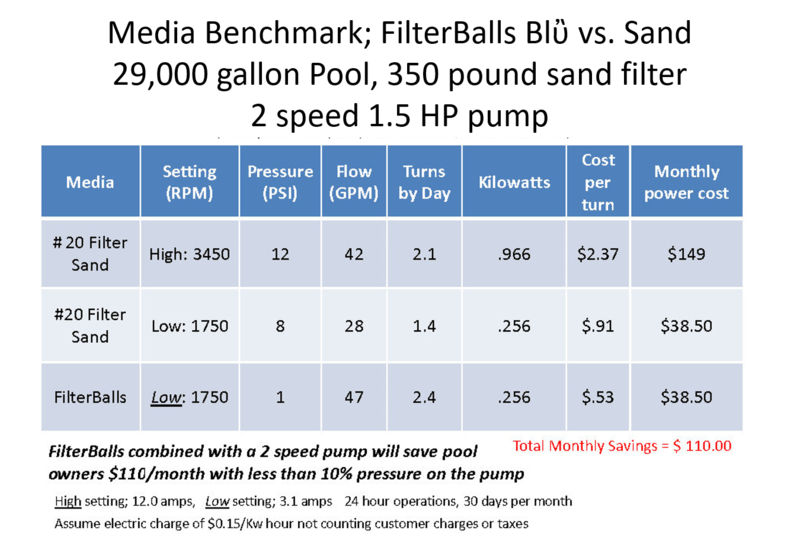 The benchmarking results illustrates the kind of power savings that can be realized by using a two speed pump, variable speed pump, or using a timer to reduce the number of hours running your filter pump. In this illustration, the filter system provides the same flow with FilterBalls on a low power setting as sand delivers on the higher power setting. Moreover, pool water turnover is not sacrificed resulting in healthy, cleaner water. Bottom line – using FilterBalls can reduce your monthly power consumption while maintaining the flow you need for clean water, heating system and salt generator flow operating requirements. Monthly savings can be 60 to 80% depending on your filter system design. And here’s the best news. Over the life of your filter pump, FilterBalls can return 10 times your investment in a variable speed or two speed pump! While FilterBalls provide improved flow on a single speed pump, you can save money by using the low settings on your variable or two speed pump for filtration and only use the high settings for backwashing.